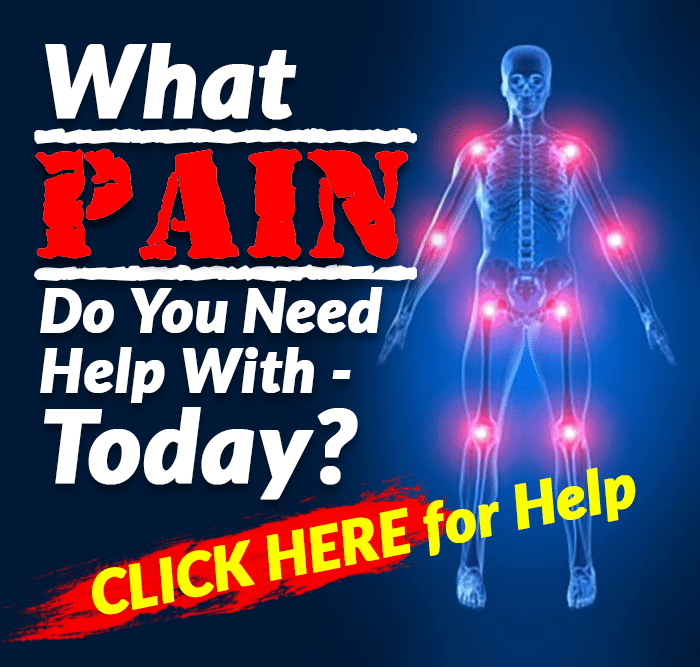 Awesome post for you on foot injury exercises. The foot is a very complex structure for both fitness and health professionals to assess effectively. Bearing weight for the majority of the day it is responsible for absorbing and transmitting forces between a contact point (usually the ground) and the rest of the body. 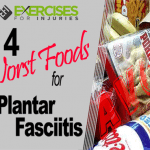 By far the most commonly diagnosed condition in the foot is plantar fasciitis. While this may be common, many conditions may develop in the foot. Without a proper diagnosis, methods of rehabilitation become blind and often ineffective. Severs Disease: Heel pain that presents in children between the ages of 8-14. Pain is similar to plantar fasciitis however, spur development is uncommon. This condition is caused by inflammation of the growth plate in the calcaneus (heel). Pain gets better with rest and is recreated by squeezing the heel. Fractures: Fractures can present with minimal or no swelling. Stress fractures are quite common in toes 2-5. Pain does not decrease with rest, the bone may be tender to the touch and night pain may also be experienced. Neuromas: A neuroma is a benign tumour originating from nerve cells due to regional irritation. Pain is quite localized and is most common between the 2nd and 3rd toe. There may be a palpable nodule that is very tender to the touch. Sprains: Impact sprains may happen especially in flat feet. Pain is sharp, tender to touch, and may be accompanied by localized swelling. Peripheral Neuropathies: Nerve entrapments higher up in the leg and back can cause pain in the foot, especially on the medial side (mimicking plantar fasciitis). Night pain may be present and symptoms are paired with problems elsewhere in the body (ie: “calf or hamstring tightness causes my heel to flare up”). Degenerative Changes: The most common arthritic development in the foot happens at the big toe. Pain is localized to the big toe, and may be present at night. There may also be the presence of a bony growth. Bunion formation can present similarly at this joint, however bone growth happens on the inside of the big toe. Assess the foot in non-weight bearing first. If a person has an arch while non-weight bearing, you should recognize there is potential for that person to create an arch. Without forces of gravity and load the foot is structurally sound. With optimal function this arch presentation should remain stable upon the foot hitting the ground. If the arch collapses in assumption of standing, the therapist/coach should start thinking of ways to improve arch stability.In individuals with arch collapse while non-weight bearing, chances of true structural issues are higher. Functional rehabilitation should still be carried out, but without expected progress an orthotic may be needed for full resolution of symptoms. In my experience orthotic prescription is required less if a correct rehabilitation protocol is followed under sound patient compliance. #2 – Is Self Myofascial Release Good For The Foot? Pes Planus: The majority of conditions happen because of the foot’s inability to be stable in a gait cycle. This loss of function leads to pronation of the foot or dropping of the arch (also known as pes planus). Pronation of the foot leads to lengthening of the tissues in the bottom of the foot. The result is pain, and irritation due to loss of mechanics. Self myofascial release (SMR) in these instances creates less tissue stiffness, and greater instability. In cases of forefoot and rearfoot pronation a coach/therapist may be better coaching SMR of the hips and pelvic girdle. Addressing tight fibrotic musculature that maximizes function of the pelvis will certainly create better opportunity for function in the foot. Pes Cavus: In cases of foot pain with a supinated (or cavus) arch SMR may be more indicated. With supination the underside of the foot is short. Shortness paired with lack of mobility through the tarsal bones leads to incorrect distribution of force. Instead of forces cascading through the foot, point loads hit hard. Force is then controlled through the soft tissue on the plantar surface of the foot, resulting in repetitive strain injuries. In cases where excessive load is placed through bones, stress reactions may occur resulting in stress fractures. The Spiral Line Stirrup: Through the work of Thomas Myers, we have discovered that fascial planes in the body can influence structures far from the site of dysfunction. The spiral line, as described by Myers, creates a stirrup underneath the forefoot. If structures along this line or in close relationship to this line lack function the stirrup will be unable to hold the weight of a person and the foot collapses. Creating a rehabilitation program that incorporates hip dominate stability with sound core mechanics will allow for efficient proximal development of force to pull on the spiral stirrup. This will allow its most distal connection (between tibialis anterior and peroneus longus) to lift the arch. Prior to the initiation of any exercise the client should be taught how to create stability in the foot. This can be done through first extending the toes while keeping the rest of the foot on the ground. With the toes extended the foot will automatically create an arch. Holding this arch in place the client is the asked to slowly lower the toes toward the floor. This by itself is a very effective tool for teaching correct foot mechanics in very early stages of rehab. As rehabilitation progresses exercises that promote stiffness during standing of the entire leg, hips and core musculature should be encouraged. Examples of these exercises include deadlifts, single leg deadlifts, and rear foot elevated split squats. The bones of the foot and toes need to move in a cavus foot to properly redistribute forces, and help create the elastic spring that allows a person to propel while running or jumping. For adequate management of these forces athletes must have exceptional mechanics of the ankle and 1st ray (the talus, navicular, 1st cuneiform and 1st metatarsal). The foot can be prepared by the athlete performing SMR on the underside of the foot for 2-3 minutes. Mobility based exercises can follow in high repetition (15-25 repetitions) for multiple sets (2-3).Have the athlete work on the elements of mobility that are the most challenging for them. Once the foot is mobilized have athlete perform integrative patterns to retrain the brain on how to use the new foot. Rehabilitation methods will vary amongst skill sets, but be sure to focus on some element of integrative movement suitable for your athlete’s needs. If treatment and methods of rehabilitation fail a good quality pair of orthotics may help support structural dysfunctions and lead to full resolutions of symptoms. Addressing foot issues with orthotics as the sole or primary intervention is usually not suggested as many foot conditions are multi-factorial. When choosing orthotics casting methods are far superior to force plate technology. Force plate technology although fancy, creates a 3 dimensional product from a 2 dimensional image. Secondly, make sure the orthotic is custom to the individuals weight. If you can collapse the arch of the orthotic with the weight of your thumb, chances are it is non-functional when a person stands on it. Lastly, a good orthotic must control the arch of the foot before it hits the ground. Quality orthosis should be full contact, which means they should control the arch at its maximal height in a gait cycle. Conor Collins is an massage therapist, active release provider, medical acupuncturist and rehabilitation specialist from Ontario Canada. In his clinical practice Conor specializes in the treatment and rehabiltiation of runners and triathletes. He has had the pleasure of working in a wide variety of sporting realms, with athletes in both amateur and professional ranks. Outside of his practice Conor is an instructor in soft tissue and manual therapy. He also provides continuing education to numerous practitioners in a variety of disciplines. 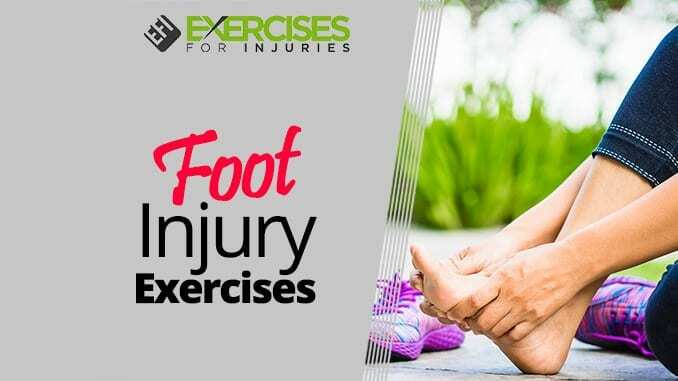 Hey, I hope you enjoyed the post on foot injury exercises. That is it for today we will see you soon.